3/18/2017–HILLSBOROUGH, NC–The Orange County Composite Squadron’s high school CyberPatriot team (“Phoenix Rising”) received the 1st Place Silver Tier Award in the recent CyberPatriot IX competition. 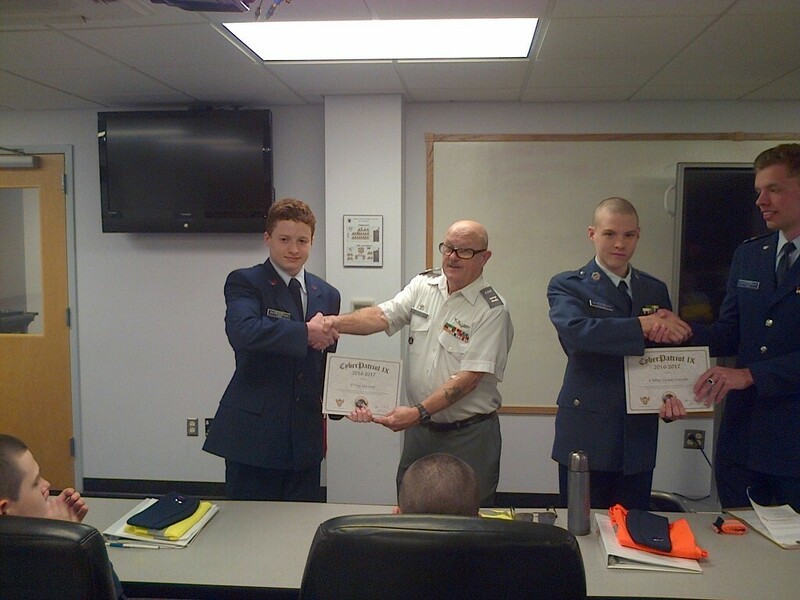 The high school CyberPatriot competition team consisted of Cadets Z. Steele, Z. Lincoln and J. Lord – with Cadet Steele serving as the team leader. Eight other cadets helped the team and assisted at practices and learning sessions. The team was awarded the certificate in honor of their outstanding technical skill, problem solving, and teamwork demonstrated by placing first in the North Carolina All Service Division Silver Tier State Round of competition. The 1st Place Award certificate was presented to the team at an awards ceremony held on 2 March 2017. The squadron also fielded a middle school CyberPatriot team (“Orange Phoenix”) consisting of cadets J. Debree, R. Khan and J. McCauley.